For the Arabist, see Henry Laurens (scholar). Laurens as he appears in the National Portrait Gallery in Washington, D.C.
Henry Laurens (March 6, 1724 [O.S. February 24, 1723] – December 8, 1792) was an American merchant and rice planter from South Carolina who became a political leader during the Revolutionary War. A delegate to the Second Continental Congress, Laurens succeeded John Hancock as President of the Congress. He was a signatory to the Articles of Confederation and President of the Continental Congress when the Articles were passed on November 15, 1777. Laurens had earned great wealth as a partner in the largest slave-trading house in North America (Austin and Laurens). In the 1750s alone, this Charleston firm oversaw the sale of more than 8,000 enslaved Africans. He was for a time Vice-President of South Carolina and a diplomat to the Netherlands during the Revolutionary War. He was captured at sea and imprisoned for some time by the British in the Tower of London. His son John Laurens, a colonel in the Continental Army and officer on Washington's staff, believed that Americans could not fight for their own freedom while holding slaves. In 1779, he persuaded the Continental Congress to authorize the recruitment of a brigade (3000 men) of slaves, who would be given their freedom after the war. However, when he presented it to them, the South Carolina Provincial Congress overwhelmingly rejected the proposal, and instead voted to use confiscated slaves as payment to recruit more white soldiers. John Laurens was killed in a skirmish in South Carolina in 1782. He married Eleanor Ball, also of a South Carolina rice planter family, on June 25, 1750. They had thirteen children, many of whom died in infancy or childhood. Eleanor died in 1770, one month after giving birth to their last child. Laurens took their three sons to England for their education, encouraging their oldest, John Laurens, to study law. The young Laurens returned to the United States in 1776, at the time of the American Revolutionary War. 1. General George Washington 2. General Horatio Gates 3. Dr. Benjamin Franklin 4. 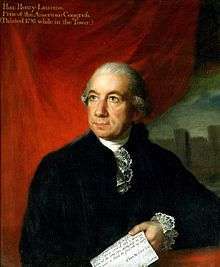 Henry Laurens, as President of the Continental Congress. 5. John Paul Jones / D. Berger sculpt. 1784. Laurens served in the militia, as did most able-bodied men in his time. He rose to the rank of Lt. Colonel in the campaigns against the Cherokee Indians in 1757–1761, during the French and Indian War (also known as the Seven Years' War). 1757 also marked the first year he was elected to the colonial assembly. Laurens was elected again every year but one until the Revolution replaced the assembly with a state Convention as an interim government. The year he missed was 1773, when he visited England to arrange for his sons' educations. He was named to the colony's Council in 1764 and 1768, but declined both times. In 1772 he joined the American Philosophical Society of Philadelphia, and carried on extensive correspondence with other members. As the American Revolution neared, Laurens was at first inclined to support reconciliation with the British Crown. But as conditions deteriorated, he came to fully support the American position. When Carolina began to create a revolutionary government, Laurens was elected to the Provincial Congress, which first met on January 9, 1775. He was president of the Committee of Safety, and presiding officer of that congress from June until March 1776. When South Carolina installed a fully independent government, he served as the Vice President of South Carolina from March 1776 to June 27, 1777. Henry Laurens was first named a delegate to the Continental Congress on January 10, 1777. He served in the Congress from until 1780. He was the President of the Continental Congress from November 1, 1777 to December 9, 1778. In the fall of 1779, the Congress named Laurens their minister to the Netherlands. In early 1780 he took up that post and successfully negotiated Dutch support for the war. But on his return voyage to Amsterdam that fall, the British frigate Vestal intercepted his ship, the continental packet Mercury, off the banks of Newfoundland. Although his dispatches were tossed in the water, they were retrieved by the British, who discovered the draft of a possible U.S.-Dutch treaty prepared in Aix-la-Chapelle in 1778 by William Lee and the Amsterdam banker Jean de Neufville. This prompted Britain to declare war on the Dutch Republic, it becoming known as the Fourth Anglo-Dutch War. The British charged Laurens with treason, transported him to England, and imprisoned him in the Tower of London (he is the only American to have been held prisoner in the Tower). His imprisonment was protested by the Americans. In the field, most captives were regarded as prisoners of war, and while conditions were frequently appalling, prisoner exchanges and mail privileges were accepted practice. During his imprisonment, Laurens was assisted by Richard Oswald, his former business partner and the principal owner of Bunce Island. Oswald argued on Laurens' behalf to the British government. Finally, on December 31, 1781 he was released in exchange for General Lord Cornwallis and completed his voyage to Amsterdam. He helped raise funds for the American effort. In a late skirmish during the war, Laurens' oldest son John was killed in 1782. He had supported enlisting and freeing slaves for the war effort and suggested to his father that he begin with the 40 he stood to inherit. He urged his father to free their slaves. Yet, although conflicted, Henry Laurens never manumitted his 260 slaves. In 1783 Laurens was sent to Paris as one of the Peace Commissioners for the negotiations leading to the Treaty of Paris. While he was not a signatory of the primary treaty, he was instrumental in reaching the secondary accords that resolved issues related to the Netherlands and Spain. Richard Oswald, a big former partner of Laurens in the slave trade, was the principal negotiator for the British during the Paris peace talks. 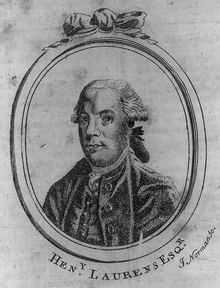 Laurens generally retired from public life in 1784. He was sought for a return to the Continental Congress, the Constitutional Convention in 1787 and the state assembly, but he declined all of these positions. He did serve in the state convention of 1788, where he voted to ratify the United States Constitution. The British occupying forces from Charleston had burned the main home at Mepkin during the war. When Laurens and his family returned in 1784, they lived in an outbuilding while the great house was rebuilt. He lived on the estate the rest of his life, working to recover the estimated £40,000 that the revolution had cost him (equivalent to about $3,500,000 in 2000 values). 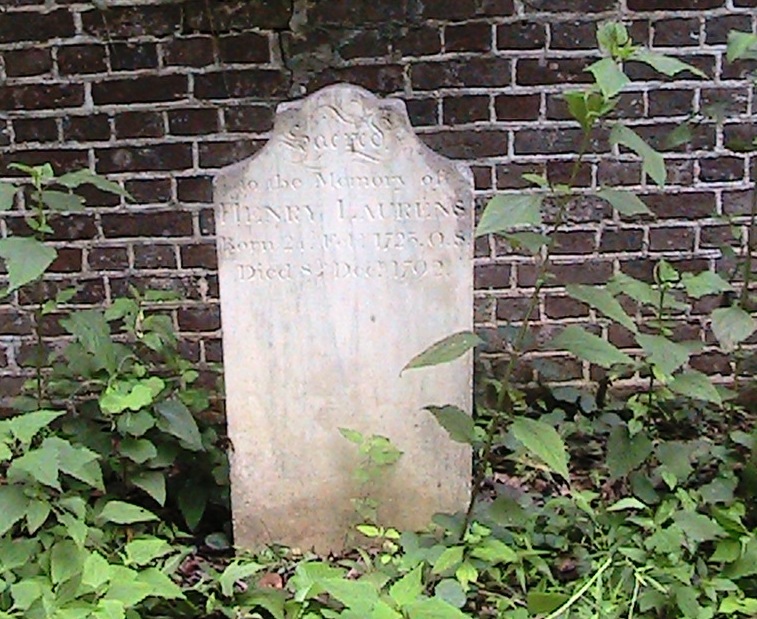 Laurens died on December 8, 1792, at his estate, Mepkin. In his will he stated he wished to be cremated, and his ashes be interred at his estate. It is reported that his was the first formal cremation in United States. Afterward, the estate passed through several hands. Large portions of the estate still exist and are used today as a Trappist abbey. The city of Laurens, South Carolina, and its county are named for him. General Lachlan McIntosh, who worked for Laurens as a clerk and became close friends with him, named Fort Laurens, in Ohio, after him. Laurens County, Georgia. is named for his son John, who died in 1782 while serving in the war. The town, and village, of Laurens in New York are named for him. ↑ Tuchman, Barbara. First Salute: A View of the American Revolution. Random House LLC. Wallace, David Duncan (1915). The Life of Henry Laurens: With a Sketch of the Life of Lieutenant Colonel John Laurens. Kirschke, James J., and Victor J. Sensenig. "Steps toward nationhood: Henry Laurens (1724–92) and the American Revolution in the South" Historical Research 78.200 (2005): 180-192. Wikimedia Commons has media related to Henry Laurens. United States Congress. "Henry Laurens (id: L000121)". Biographical Directory of the United States Congress. The Henry Laurens Papers, including 486 letters covering a wide variety of subjects, are available for research use at the Historical Society of Pennsylvania.